Spotlight Sunday is a way for Choicest Games to feature PC games that are scheduled for release on the following week - games that we consider worthwhile checking out. As mentioned, this is a visual novel so if you don't like the genre at all, you can stop reading now. 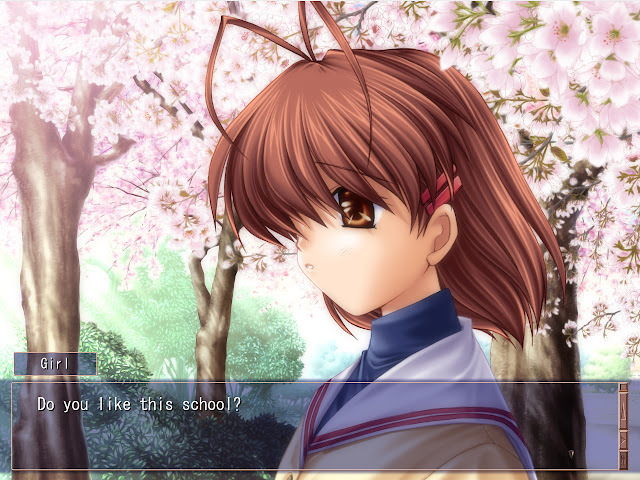 However, if you like games with a strong plot, I daresay CLANNAD is going to be a game that hits the mark. Firstly, the company behind the game called VisualArts/Key have already released an old visual novel game on Steam that originally came out in 2004 called planetarian ~the reverie of a little planet~ (what's with the Japanese and the use of tildes in their game titles? Oh never mind). planetarian is a highly rated game on Steam with an "Overwhelmingly Positive" score of 98% from 585 reviews. Apparently it's very emotional despite the fact people say no choices can be made in the game (so I'm guessing it's a kinetic novel). CLANNAD also originally came out in 2004 and this Steam version promises to have higher definition graphics, Steam achievements and a thing called a "Dangopedia" for all the Westerners out there that are perplexed by Japanese culture. The reason you should take notice of CLANNAD is because it's not just any visual novel game since it happened to spawn a huge franchise in Japan thanks to its success. The original game was the best-selling PC game in Japan and was ported to several other platforms such as Playstation 2, PSP, Xbox 360, Playstation 3 and PS Vita. It also exists in other media such as manga, comic anthologies, light novels, art books, audio dramas, music and anime (the anime was also critically acclaimed). So even if you're not big into these kind of games but are even remotely curious as to what is considered a Japanese gaming masterpiece, CLANNAD is probably worth a look. So are you interested or excited about any PC games being released next week? Which games are you looking forward to?